The terms "estate tax" and "inheritance tax" are sometimes used interchangeably to refer to a tax that's collected as the result of someone's death. They're not the same thing. An inheritance tax is based on who receives a deceased person's property and the value of what they receive. The federal government does not have an inheritance tax. An estate tax is imposed by a state or the federal government based on the right to transfer a person's assets to her heirs after death. An estate tax is based on the overall value of the deceased person's estate. An inheritance tax is based on the value of a specific bequest. Another major difference is that an estate is liable for paying the estate tax while the beneficiary is responsible for paying the inheritance tax. 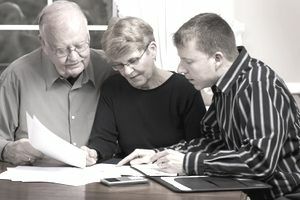 But in some states and under the terms of some wills, the executor or personal representative of an estate might pay the inheritance tax from the estate on behalf of the beneficiary. Tennessee imposed a state death tax that was based on the overall value of the deceased person's total property, which is technically an estate tax. But the state referred to this tax as an inheritance tax in its statutes and the tax was ultimately eliminated in 2016. Oregon used to call its state estate tax an inheritance tax as well, but that changed on January 1, 2012. The tax rightfully became known as what it is, an estate tax. Twelve states and the District of Columbia have estate taxes as of 2018. Only six states have an inheritance tax: Maryland, New Jersey, Pennsylvania, Kentucky, Iowa, and Nebraska. Indiana had one but the state repealed it in 2013. Maryland has both an inheritance tax and an estate tax. Among the states that impose inheritance taxes, most exempt immediate family members. Spouses are exempt from these taxes in all six states, and some exempt the deceased's children as well. Charitable organizations that inherit are also usually exempt. The tax rate usually graduates depending upon the degree of kinship between the deceased and his beneficiary. In states that don't exempt the children of the deceased, these beneficiaries typically pay the lowest tax rate. Small inheritances can often avoid the tax because taxation doesn't kick in until the gift's value passes a certain value threshold. For example, New Jersey's inheritance tax ranges from 0 percent to 16 percent, but the 16 percent rate applies only to bequests valued at $1,725,000 or more. Most states with an inheritance tax have similar graduated systems. If you think you might be subject to an inheritance tax, speak with a local accountant or estate planning attorney because the rules can vary. *Note: State laws change frequently, and this information may not reflect recent changes. Please consult with an attorney for current legal advice. The information contained in this article is not legal advice and is not a substitute for legal advice.